Current sound bites, headlines and social media diatribe would suggest the life support system has long been turned off on visionary and principled leadership in Australian politics. The daily mantra seems to be – Another day, another opportunity to drive a wedge between ‘us’ and ‘them’. Whether it’s denigrating people who are legally seeking protection in Australia as “fake refugees”, a white-washed “Australians first” ad campaign, or the economically disastrous and thinly-veiled xenophobia of “zero net immigration” – we are frequently subject to political strategies of divide and rule. We are now encouraged to believe that exclusion is in our national interest and a cohesive society is only possible if some people go without. I am witness, however, to another perspective. As the National Manager of Welcoming Cities, I have the great privilege of travelling this beautiful country and meeting with Mayors, Councillors, Local Government workers, community agencies, business owners and community leaders. People and organisations who are passionate about the communities they live, work and play in. My observation is that they want the same thing. They all want their communities to thrive. They want everyone in their community to have a sense of value and belonging and to be able to participate in, and contribute to, the economic, social and civic success of their neighbourhood, suburb and region. As community leaders they are committed to welcoming both established residents and newcomers alike. They also face the same barrier. Community leaders operate in the tension of doing what they know is right and works versus the small, but almost deafening, voices of fear and dissent. The majority of people want their leaders to be welcoming and inclusive. But the amplified alarmist voices are compelling too. Fear is a strong motivator, especially when there is a suggestion that your way of life might come under threat. Leaders are hesitant to stick their proverbial necks out on matters of principle and inclusion because they fear their political future might be short-lived. Until recently, I had never conceived a world where welcome might become a dirty word. But I have had conversations in communities across Australia suggesting that this might be the case. The strategy of divide and rule is beginning to call into question the language and process of welcome. The politics of division is attempting to paint welcome as an exclusionary term that privileges newcomers over existing constituents; suggesting that somehow the welcomer is diminished and marginalised by the people to whom they open their arms. Not only is the concept absurd, it is also a dangerous and foolish approach. Attempts to create and reinforce a paradigm in which some people are more welcome and more ‘Australian’ is self-injurious behaviour. In pandering to shock jocks, polls, and self-interest political leaders are hurting the very communities they are elected to serve. And, in turn, they are hurting themselves. Our nation and planet must grapple with some significant challenges. Challenges that will not be solved by pitting us against each other and creating tribes based on who we exclude. Welcome invites solutions and ideas from all people, it doesn’t filter them out based on who is presenting them. Welcome is not either-or, it is both-and. 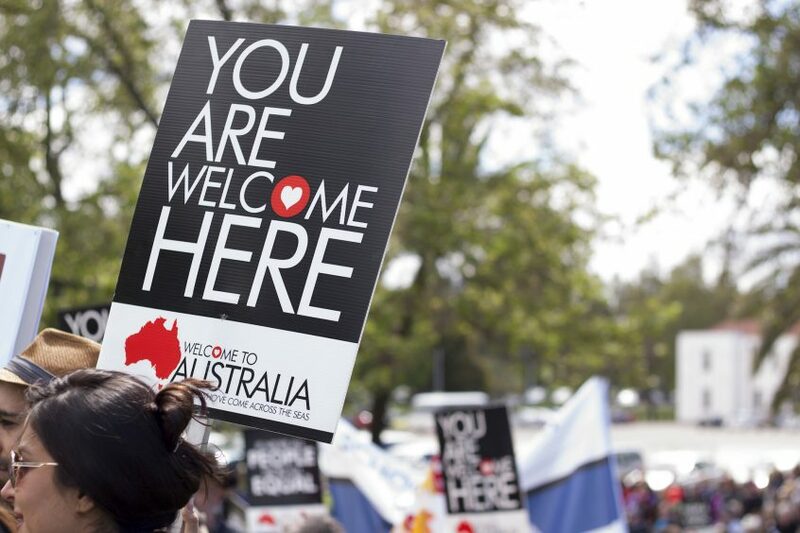 From Aboriginal and Torres Strait Islander peoples through to the diversity of new arrivals to our shores, welcome should be embedded in who we are as a nation. Welcome involves greeting and settling new neighbours, and valuing and engaging long-term residents. Welcome is about how people add to the diversity and strength of our neighbourhoods, not how they might detract from them. Welcome seeks to facilitate an environment in which all people can make a contribution to their communities and feel encouraged to do so. Welcome is a framework for enhancing social cohesion, economic development and civic engagement. Welcome is at the heart of our sporting clubs and cultural institutions. Welcome grows opportunities and commerce and fosters environments where everyone is invited to the table. The leaders who embrace welcome know that the way forward is risky but far more rewarding. Cities, municipalities and regions such as the City of Port Adelaide Enfield, the City of Stirling, the City of Canning, Hume City Council, Moreland City Council, the City of Greater Bendigo and others are choosing to walk down that path. They demonstrate leadership built on the understanding that welcome is not only a lovely idea or a banner waving exercise; it is a commitment to fostering a sense of belonging and socioeconomic participation for all people. The success of our communities should be measured on their capacity to attract, retain and sustain business owners, employers, families and students; and a commitment to increasing levels of social cohesion for all their members. We need leadership that values the ideas and innovation that come from being welcoming and inclusive. We need leaders who believe that welcome is not a dirty word.